Additionally we recommend, with the KKRM or the Cyclops trainers, that skateboard deck tape (adhesive non-slip sandpaper) be wrapped around the trainer's roller to reduce tyre slip. Be prepared to replace this regularly, it's cheap. This is not necessary with the direct drive of the Lemond Revolution. We recommend the KKRM before the Lemond despite this as the Lemond is less stable and hard out-of-the-saddle accelerations are unsettling on the Lemond, despite its superior direct drive mechanism (and, it's very noisy!). The Wahoo however, is, in our opinion, the best of the breed at this time. We suggest at a minimum a cycle computer that measures cadence and rear wheel speed, ideally a power meter is best for tracking your efforts. We're not terribly interested in your heart rate but it can be interesting to look at when you're bored between sessions. You will probably notice that the structure of these sessions differs from that which we propose for track sessions. Track sessions are typically a longer warmup, then three or four blocks of effort with around 20 minutes between blocks, while these ergo sessions are much shorter in duration and also recovery between efforts. This is partially a pragmatic issue, spending two hours sitting around between efforts on an ergo is too boring and time-inefficient, and also our emphasis with ergo work is primarily improving repeatability and most efforts are very short, you don't need 20 minutes to recover from a 7 second effort. 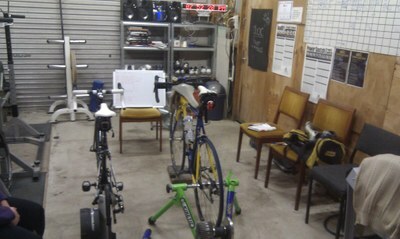 It's rare to do 7 second efforts on track, on an ergo it's much more common. We define a number of scaled effort types designed to target specific aspects of sprint performance, from raw strength to capacity in both a repeatability and duration context and also accelerations from various starting cadences. Additionally, unless otherwise noted, all specific efforts are unpaced, ie: as hard as you can go from the start. Sometimes, you will run out of energy and blow up, this is expected and necessary. Sometimes you will need a bucket by your side. R/up : Ramp up, this means during the effort there will be changes of pace, generally cadence, these are the only paced efforts we do on an ergo. E1 : This is derived from our enduro cousins and their heart-rate based approach to intensity. We use it as a very low, conversational pace effort, if you were using a heart rate monitor we'd expect to see a heart rate of around 120-140bpm during an E1 effort. We only use it for a warm up. HCLR : High cadence low resistance, a very easy gear (39x21 or similar), just rev like crazy! SS : Standing Start - this just means your rear wheel is not moving at the start of the effort. This will usually be followed by L,R meaning left or right leg as your starting leg. If there's no L or R, it just means use your preferred leg. Seated : Stay in the saddle. Unless this is stated, you can get out of the saddle for some or all of the effort. Generally we accelerate out of the saddle then sit once up to speed. Between efforts we want you to do nothing or next to nothing. You can get off your bike and lie down if you need to, you can sit on the saddle and just tick over very lightly. Do NOT do anything resembling an effort! PG+4 is Power Gear plus 4 gear inches (you will generally need to approximate this, within 2" is near enough). These modifiers do not work well for magnetic trainers, they work well with our sample ergo sessions only with fluid trainers or wind trainers with substantial flywheels, as described above.